Time to Play: 30-40 Min. Once a year, the paddle-wheel captains raced their ships on the unpredictable Mississippi to determine which ship would hold title of "Mississippi Queen". Now you can relive those thrilling races with family can friends. The unusual game board grows during the game, revealing which direction the river flows. During the race, you decide how much steam to make, how to manage your limited coal supply, and where to pick up passengers. 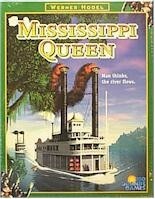 The first player to dock his paddle-wheeler at the finish earns the title "Mississippi Queen" for his ship.